"I used a shallow bowl for this recipe so that the scallops can be seen rather than sinking to the bottom. This recipe is very quick to make and an elegant starter to a meal for your guests. 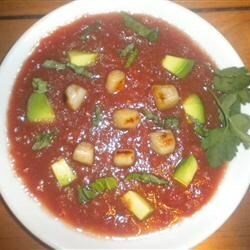 It is also a winner without the scallops and if you grow your own tomatoes, you can use the softer tomatoes and the flavor should be even better. Drizzle a little more avocado oil over the soup and you are ready to serve." Place the tomatoes, balsamic vinegar, avocado oil, and 1 teaspoon of salt into a blender. Puree on high until smooth, then strain through a mesh strainer, and refrigerate until cold, at least 2 hours. Heat the oil in a skillet over high heat until it begins to smoke. Place the scallops into the hot oil. Cook until the scallops are golden brown on each side, and the center has turned opaque, 1 to 2 minutes per side. To serve, pour the chilled soup into shallow bowls. Scatter the diced avocado into the soup, and place 4 scallops in each bowl. Sprinkle the soup with ground pepper and torn basil leaves to serve. I used 2 cans of diced tomatoes because that's what I had and used basil oil and olive oil. My husband and I both loved it and will make it again! This was pretty tasty and light. I used bay scallops instead of sea scallops which wound up being a mistake. Trust me- splurge on the more expensive sea scallops.